Founded in 1977, the American Women's Club of Southern Ontario (AWCO) is a non-profit organization serving both the community and its members. The requirement for membership of the Club is citizenship of the United States of America either by birth or naturalization, having resided in the United States, or having an immediate family member (parent, grandparent, partner, or spouse) that is a US citizen. 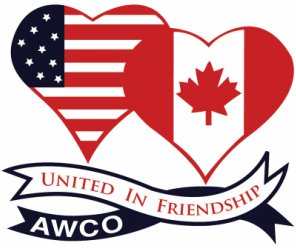 Now in existence for over 40 years, the purpose of AWCO is to provide fellowship and social activities among Americans and to encourage participation in service to the community, both civic and philanthropic. The Club has fostered friendships among members, some of whom have settled permanently into the area. It brings together newly arrived Americans with seasoned members to provide fellowship and support with multiple social activities for assimilation into the community. The Club has provided volunteers for the annual blood drive, a day of bell ringing for the Salvation Army, and assisted various other local charities. Highlights include a donation for the Millennium Clock in downtown Oakville (where the club's name may be seen engraved upon the pedestal) and a $25,000 donation to the Oakville-Trafalgar Hospital Foundation. In recognition of this contribution, the Quiet Room of the Special Care Nursery at the new hospital will be named in honor of the AWCO. In addition to meeting on the second Thursday of every month, September through May, the AWCO sponsors monthly meetings, activities, and special events for members and their families.